A week ago, a Ravelry pal that I know from the “Bunny Rabbit Lovers” group suffered an awful tragedy. Her elder 10 year-old son had an accident which resulted in 60% of his body being covered in full burns — meaning full skin-grafts were needed. He and his mother are at the Shriners’ Hospital in Cincinnati, OH. It was in the back of my mind that she was also from the Roanoke Valley area of Virginia where I visited for that memorable weekend in April. Knowing that she needed help to take care of the various animals on her farm — she has 17 housebuns — my heart was torn. 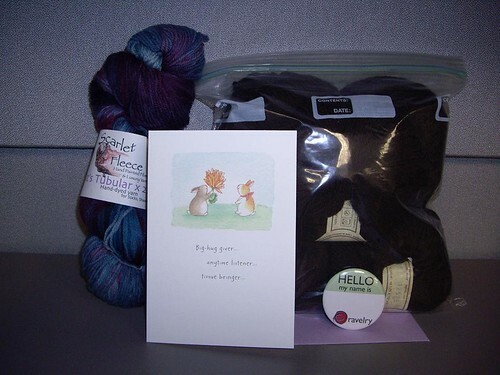 In the “Bunny Lovers” and “Roanoke Valley Crafters” groups, she said that knitting was the only way she could cope with the stressful waiting periods and the nervousness. Though I already sent her a little package of yarn, I joined the Roanoke Valley Crafters to help make 8-inch squares that will be sewn into a blanket. Mission Falls 1824 Merino was donated by the wonderful Becky of Knitters Knook Yarn Shop (sorry, she has no website, so I put the Ravelry link here). Since I have a full-10-skeins bag of MF1824M in Pistachio, I decided to grab 2 balls and see how many squares I can make. 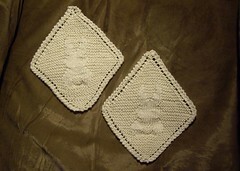 So far, I made 1 1/2 squares out of a skein, and have 2 squares completed. I will probably end up making 4 total from this stash of MF1824 Wool. 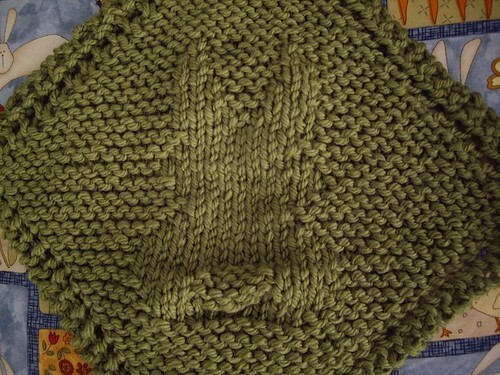 As for the pattern I am using? 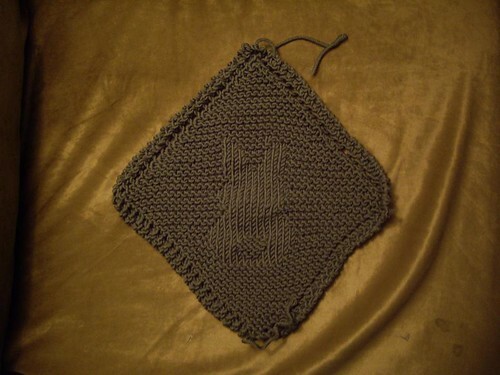 I am such a goober because it is the same one I love using for blanket squares — the Bunny Dishcloth pattern by Judith Prindle of the “Dishcloth Pattern Corner” blog. I used it for Stephanie, Suzanne, and now I am using it for young Austin. If anybunny is interested in helping out the local SPCA handling Rabbit Rescuer’s re-homing of the houserabbits, donations of any amount would be greatly appreciated. The Roanoke Valley SPCA is waiving the adoption fee for those who have taken in these well-loved house rabbits. Please feel free to mention that “Some Bunny’s Love” passed out the info. Wait, what time is it? Secret Pal 12 Question time! 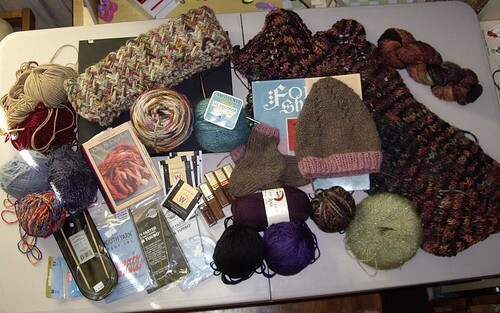 If youâ€™d like to share a storyâ€¦Tell us about a time that you packed too much knitting or were stranded without knitting. Answer 1: I always take at least one time-consuming project with me, especially if it is a WIP that has been sitting around for awhile. This way I am forced to work on it and get it done. 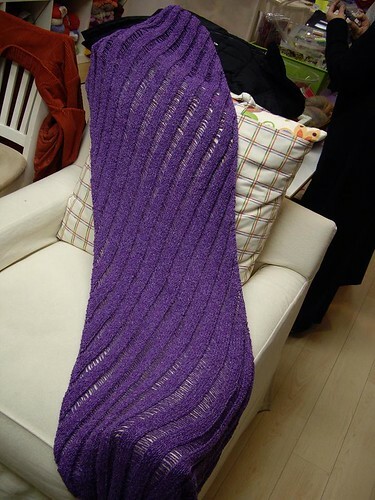 Doing that allowed me to finish the 14th Clapotis for Karen’s shop, Fresh Purls, in April. For my last trip home, the Killer King Caesar was my incentive. ← Never Fear, Pals Are Here! thanks for the squares! poor Austin will be covered with love from far and wide! I’ve used that pattern before…what a nice gesture! 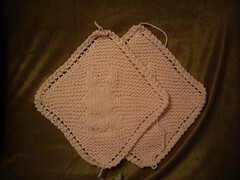 Darling squares! I know they’ll fit so nicely in the blanket!! !